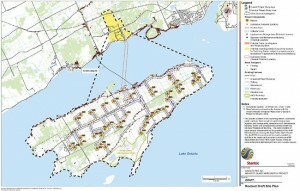 A map of Amherst Island from the Revised Draft Site Plan by Windlectric. 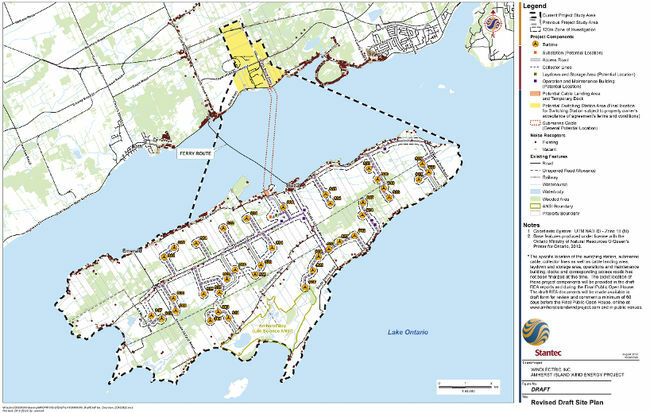 STELLA – A controversial wind energy project for Amherst Island has received conditional approval from the Ontario government. The Ministry of the Environment and Climate Change announced Monday the project received a renewable energy approval with more than two dozen conditions. Windlectric Inc.’s Amherst Island Wind Energy Project is to include up to 26 wind turbine generators and one substation transformer. The project has been ferociously opposed by many island residents, who argue the project is bad for their health, the environment and the heritage of the island. The Association to Protect Amherst Island said the project proposal, which the government deemed complete in January 2014, is not finished and leaves too many unanswered questions. Since July 2014, the project has been modified four times, including a change earlier in May that lowered the maximum number of wind turbines from 33 to 26 but replaced the remaining turbines with higher power models. In addition to the project approval, the government placed 27 conditions on the project. Among the conditions is a three-year time frame to get the project built, requirements to monitor noise emissions and ensure they do not exceed acceptable limits, implement a post construction natural heritage monitoring program, which includes bird and bat monitoring and complete any remaining archaeological fieldwork.